When visiting a new city, I always try to look for things that make it unique. No doubt when someone says St. Louis, the Gateway Arch and the Mississippi River immediately come to mind. 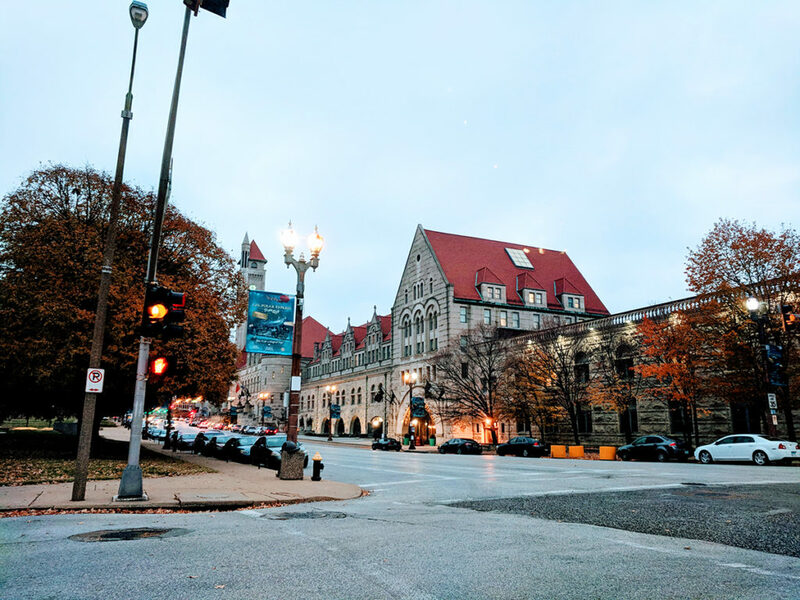 While these two features definitely make St. Louis unique and should be included on your itinerary, there is so much more to see and do in this friendly city. I spent a couple of weekends eating lots of BBQ (more on that in another post) and donuts and generally just trying to get a feel for the city. 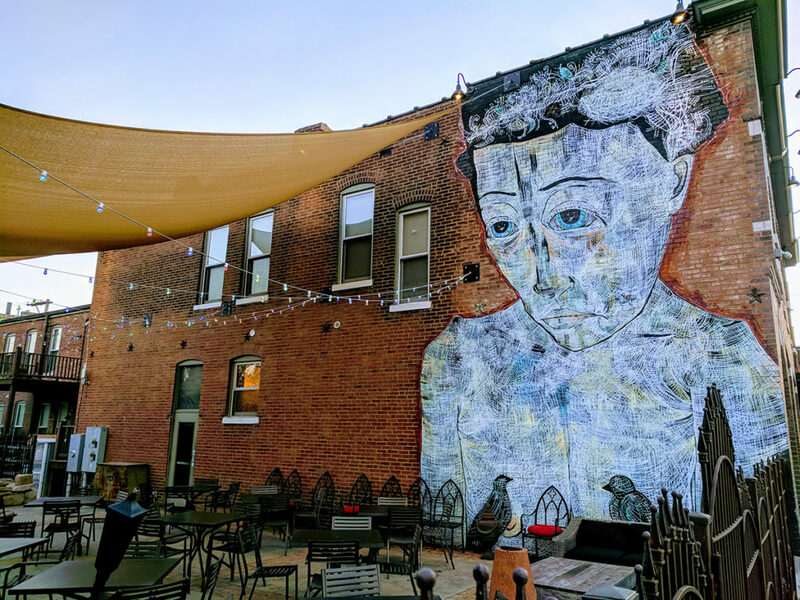 From restaurants that have been around for ages, to re-purposed buildings and street art, here are some unique St. Louis experiences for you to try when visiting St. Louis. Union Station Hotel: In 1894, St. Louis literally became the Gateway to the West when Union Station opened. At that time, it was the world’s largest and the busiest train station. Just the roofed trainshed covered forty two tracks! At one point 100,000 passengers a day passed through the station. In the 50’s and 60’s, with airplane travel becoming more easily available, train travel decreased. The station was too expensive to maintain so in 1985, after an extensive renovation, it reopened as a hotel. 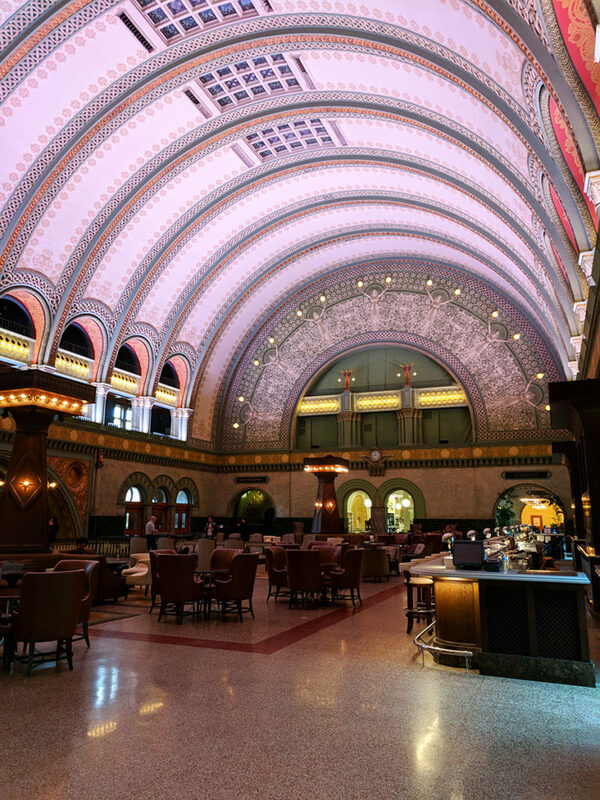 Now a member of the Historic Hotels of America and a National Historic Landmark, the Union Staion Hotel has over 500 rooms, a Grand Hall, which includes a bar, a water feature outside under the trainshed, that features a nightly fire and light show and a restaurant. The rooms are decorated in a classic, neutral train theme. The bathrooms were large and had bathtubs, of which I’m always a fan. While the entire hotel is amazing, the star of the show for me was the Grand Hall. Even if you aren’t staying at the hotel, it’s definitely worth stopping by to see. It’s a huge arched space with frescoes, mosaics, gold leaf details and stained glass that is hand cut Tiffany glass. You can enjoy the 3D light show that’s shown on the ceiling, while sipping a classic cocktail at one of the longest bars I’ve ever seen. If you want to grab something to eat, they have a really great burger too. Lombardos: In town since 1934, this restaurant IS St. Louis. Family owned and operated, they serve authentic Italian food featuring pasta, steaks and seafood. There are a couple of locations but I dined at the one conveniently located across the street from Union Station. I had the fried ravioli, which is a must when in St. Louis and some of the best garlic cheese bread I’ve ever had. It’s always a good sign when you see a bar full of locals. A testament to great food and service. The Fountain on Locust: If you ever wanted to have a meal in an old Stutz auto showroom, put the Fountain on Locust on your list Hip and decorated with hand painted art deco designs, they serve delicious made from scratch food and cocktails. While their food is delicious, it’s their ice cream and boozy desserts that make it unique. Generally, I’m not a huge ice cream fan but theirs, sourced from a dairy in Wisconsin, is so good, I would eat it every chance I got. All the sauces and toppings are made in house too. If you’ve only ever had chocolate sauce out of a bottle, you don’t know what you’ve been missing. I also loved the fact that a lot of the cocktails were named after famous St. Louisans. I had a gin based, T. S. Eliot, after the poet born on Locust Street. How cute and unique is that? Thaxton Speakeasy: The perfect Speakeasy should be secret, hidden and dark with great cocktails. Let’s just say Thaxton is a Speakeasy done right. They are the only password protected bar, or underground lounge as their website states, in St. Louis. Located in the Historic Thaxton building downtown, you enter street side and go into a room they use for events. Down the steps into the basement bar. The whole experience IS secret and prohibition. The cozy bar has friendly, knowledgeable bartenders mixing drinks with an emphasis on the classics. I was served a perfect Aviation, which can be a tricky drink. They have live music on Thursdays and some other special events from time to time. You can sign up to receive the weekly password on their website by providing your cell or an email. 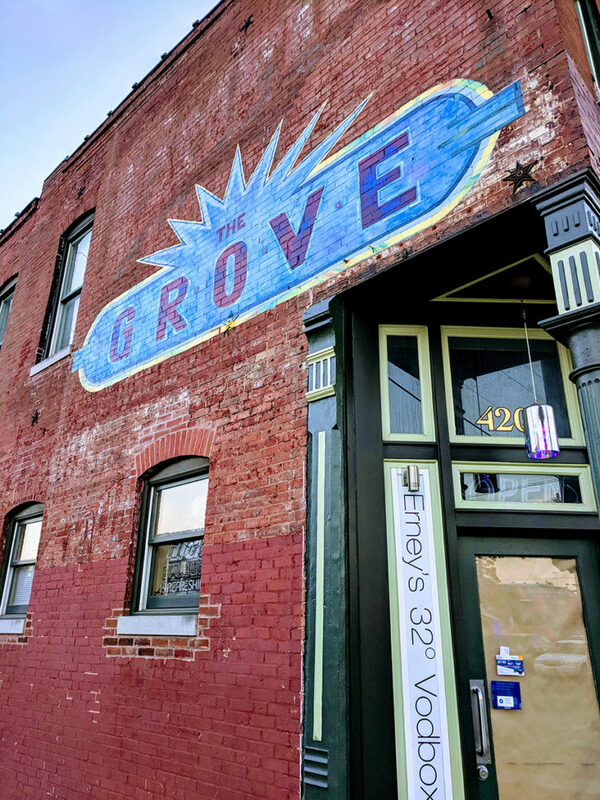 The Grove: Located in Forest Park area of St. Louis, The Grove, once called Adam’s Grove in the 50’s, was a busy commercial district during that era. After experiencing a decline, the area has been brought back to life and revitalized. It’s now over fifty businesses and is booming again. There’s a brewery, multitudes of restaurants, bars, coffee shops and street art galore. St. Louis Public Library: Ever since I worked in the library in elementary school, I’ve had a thing for libraries. I happened upon the Manolo Valdes’ sculpture ‘Butterflies’ on the outside terrace of the St. Louis Public Library on, unfortunately my last day. After doing some research when I got home, I learned the library, built in 1912, had closed for a renovation a few years ago. The city, wanting to add more access to the public while preserving the beautiful building, increased space by 45%, added a three story atrium and removed some of the book stacks to show off the space. It’s beautiful inside and out. The Manolo sculpture was just the first step of real butterfly garden they are hoping to add. I’m definitely making time to go inside when I’m there next time. Getting to St. Louis is very convenient. Because of it’s central Midwestern location, flights into Lambert International Airport (STL) are no more than a couple of hours from most major US cities. TSA Pre-check is available at the airport, but at the time of writing, Clear is not available yet. Car rentals are a quick shuttle ride away with plenty of gas stations nearby for fill ups when you return your rental. Valet or self park is available at Union Station Hotel. Check their website for current prices. This whole area is under construction since they are adding an Aquarium and other attractions in this area. Coming Fall 2019 and expected to be open 365 days a year! Getting around St Louis, in my opinion, was very easy. Traffic was never congested. Although I heard others complaining about it, coming from Atlanta, it was a breeze for me. I didn’t use any public transportation while I was there but I did Uber a couple of times and found that very convenient as well. Street parking is metered but very affordable. It’s $.25 for every fifteen minutes. Free on Sundays and after 7pm Monday through Saturday. In some areas there are parking lots where you can pay to park. They cost a little more but I found them to be mostly affordable as well. You can use your credit card to pay. The City has also provided a website that helps you find downtown parking. There were only a couple of areas that I had trouble finding parking, mainly because it was a new city for me and I really didn’t know where to look. The Grove was one of those areas. St. Louis offers so much fun stuff to do. It’s especially great for families because a lot of activities are free. The St. Louis Zoo, The St. Louis Science Center, and the Missouri Botanical Gardens all have free admission for kids. Some special exhibits may have fees. While in St. Louis, don’t miss out on the wonderful donut shops in the area. I wrote about visiting some of them here. 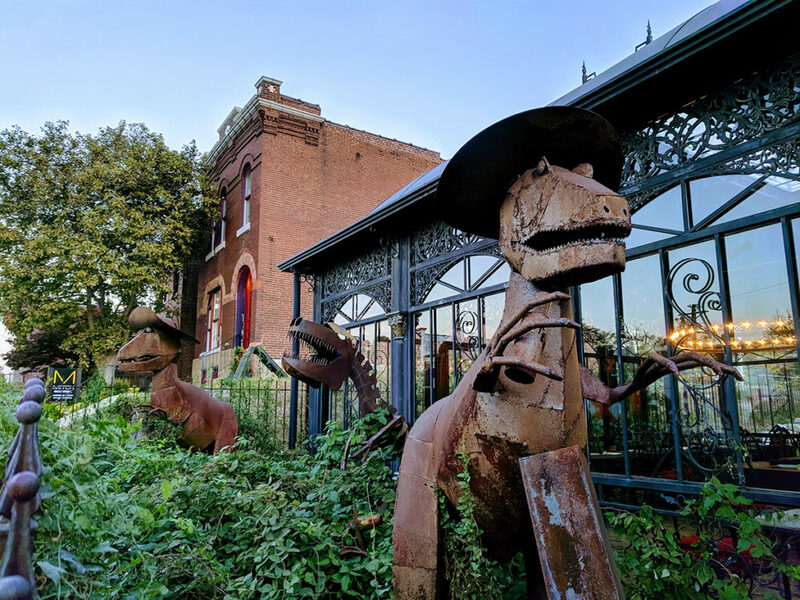 Drop me a comment below if you know of some other unique St. Louis attractions that shouldn’t be missed. I’ve only visited St Louis as a kid and would love to return as an adult. I love those dinosaurs and looks like quite a bit of art scene. Also, that food is making me hungry just looking at it! The art is great! I couldn’t post all of the photos I had of the art. There’s actually an entire wall that runs along the river that’s all murals. You should definitely go back as an adult. It’s a great city! That would be great Cynthia! That road trip sounds like a great one! Can’t wait to follow along. I loved the Grand Hall too. It is stunning!